St. John’s Kindergarten opened in 1946. It is a half-day program that covers all of the concepts necessary to prepare children for the first grade. 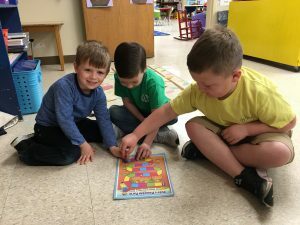 In recent years, the kindergarten has made strides to update and engage students through new technology and teaching methods. They have introduced smartboard technology to the daily life of the classroom, and this year they purchased five new iPads. 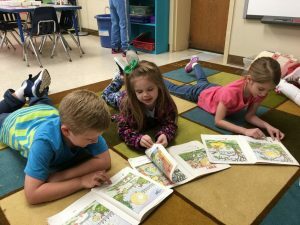 Recently, Teresa Stoner, director and Pre-Kindergarten teacher, and Bonita Rowland, Kindergarten teacher, participated in an extensive 30-hour teaching program focusing on training and improving reading, writing, and spelling skills. Orton-Gillingham is a multi-sensory technique that has been used for over 50 years. “We have been implementing it with great success,” says Bonita Rowland. Tanya Restar, parent at St. John’s pre-kindergarten, says her daughter enjoys learning because of her time at St. John’s, “Selena entered pre-kindergarten a little slow to warm up and most definitely not interested in learning. It has been amazing how quickly we noticed changes in her. Selena comes home from school eager to discuss and demonstrate what she has learned. It is truly exciting to watch her using the Orton-Gillingham techniques. She actively taps out the words. “She is not only growing intellectually but also spiritually. Selena comes home sharing what she has learned in chapel and loves the Bible stories. While the methods and technology have been updated, the teachers’ passion and the commitment to the original objective, “to help the child develop into a “whole” personality – physically, emotionally, mentally, socially, and spiritually” has remained at the core of the St. John’s Kindergarten. Spaces are available. In order to register for Pre-Kindergarten, the child must turn 4 by Aug. 31, 2018. To register for Kindergarten, the child must turn 5 by Aug. 31, 2018. Call 704-636-4404 or email kindergarten@stjohns-salisbury.org. If you are in need of after school child care, St. John’s Kindergarten partners with St. John’s Child Development Center. The child development center has a “wrap-around program” for after school care.